I'm sitting here fairly tingling. It will sound strange to some, but with the advent of the new year, I also got the huge gift of clearing up some thoughts that have been holding me back for a few years, and it feels wonderful! You see, for years and years, there were all sorts of (we'll just call them) herbalists. Some of my friends are very serious medicinal herbalists. Some of them are very happy just taking care of their families, choosing to switch to allopathic medicine when it becomes that a situation is not self-limiting. I have friends who know their stuff, but choose to use herbs mostly for cooking and decorative uses. Some just like to garden. There were so many different crayons in the box, and not a one of them was superior to the other. For years and years, that was just fine. Recently, it seems that there is a more narrow, specific accepted modality. A specific sort of spirituality is often associated with it. I've talked to very gifted herbalists who have become too intimidated by this situation to write anymore. Well I'm done. I'm tired of this narrow definition. Because people do the best they can. Because I know too many people who don't eat in the prescribed way, but they still deserve to learn about herbs. I ate at Sonic a few times this year. Sue me. I know too many people who do own TV's, and they watch them, too. I'm one of them. Because there's nothing wrong with whatever way a person chooses to come to herbs. If they don't sense the Devas or think of the herbs as their personal allies, that's okay. If they worship at the foot of a tree, that's okay too. Everything in between is a-okay with me too. Nobody starts out knowing everything, and I will not be making anyone feel like less because they don't. Folk herbalism has sufficed for a long time. If that's what people want to do - great. If they want to spend their lives studying and learning as much as an MD - that's wonderful. But I'm going back to the old way. I'm not going to judge people by the way they live or the sacrifices they make. It's too limiting, and too exclusive. I'm getting too old to think that people should live in a certain way. There's a whole lot of gray between the black and the white. You want to talk about herbs and have a little walk in the woods (or you're not "the outdoor type" but still want to talk about herbs)? Fabulous! That's what it's all about. Every single crayon is beautiful in it's own way. In the last year or so, there have been essays written mourning the loss of penmanship due to everything being typed into computers. We've been seeing articles fretting over the demise of proper language skills because of texting. Those things are worrisome, but it's beginning to seem like they might just be scratching the surface. Years and years ago, a college assignment was to write a short paper about the value of language. Right off the deep end I went, writing about a village that had forgotten language and was burnt to the ground for want of the ability to communicate. My instructor liked it enough to submit it for publication, and so began my life of rearranging words. Never did I think that I'd be pondering the possibility of that happening, however. The advent of e-mail meant that people could talk to others almost instantaneously all around the globe. We all had an instant audience. Initially, it seemed that people were writing much more than they ever had before. It was wonderful. An excellent example would be soapmaking. We'd learned from a single (not so great) magazine article, and then a lot of trial and error. Suddenly there was a screen that held all the secrets that had eluded us! The sharing of information was beyond what any of us had previously imagined. There was a lot of what was called "flaming" as people tried to learn how to speak to invisible, disembodied others and take into account all the kinds of folks would be out there. Netiquette was born. It was a good thing, but not easy at first. Blogging begins, and again the sharing and learning and attempts at understanding other kinds of people is further underscored. Then what we now call "social media" came into being. I resisted for a very long time, and then fell right into step on Facebook. I even tried Twitter for a short time, but the limit of (is it?) 120 or 140 characters, while sometimes amusing from a word puzzle standpoint, lost it's luster quickly. Facebook devolved into a place where mostly we all click the "share" button to pass around something we like, or worse, we "like" something. Liking something is akin to a grunt, really. It says, "I want you to know that I care enough to acknowledge this, but don't really have a comment." In marriage or other long-term relationships, it would definitely be a grunt. I have been heartened to be included in a couple of private groups where actual conversation goes on, but it is not the norm. The Yahoo lists that flourished for a decade are fairly flaccid now, and many people while still reading them, do not wish to respond. It would seem that actually having to type out an entire sentence or paragraph is just too much. I don't mean that in a sarcastic way. It just feels that there is a societal shift to extreme brevity. Maybe it's because we've all been burned in one way or another. Had our ideas taken because we forgot we were talking to people we didn't know, gotten attacked for telling our story, or maybe it was just the sheer volume of talkers made many others feel that their contributions weren't of value. I've come to miss the real conversations. I miss people who were new to something inspiring others to look at it in a new way. I miss the days when everyone's words had somewhat equal value. More than anything, I hope that we don't lose our ability to converse, share ideas and knowledge, and express ourselves. Here's hoping that the next change on the horizon (there always is one, isn't there?) will bring us back to our ability to communicate. Sometimes, much to the chagrin of the next generation here on the hill, I'm unable to restrain myself from getting mushy. 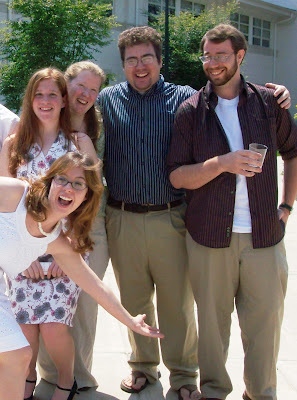 We had a graduation over the weekend, and I'm stuck on a long, long walk down memory lane. 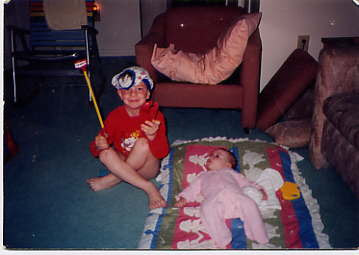 My nephew might be miffed with this post, but the two of them have always been more like brother and sister, so no post about watching my daughter grow up could ever be complete without him. We're so proud of them both. He was the only one who could stop her tears sometimes, and would go to great lengths. It is hard not to think about how it was to be in this place, with the siblings, as we walked into our grown up lives filled with expectations, our arms and hearts wide open. How quickly we went from our graduations to middle age and beyond! Watching our kids get on with things is bittersweet. They took forever to get here in the first place, and now most of our work is done. My sister's son has moved on to a large city in the Northeast, working at a dream job with a brilliant career ahead of him. My daughter finished school with a pretty great job in her field waiting for her. Who knows what either of them might accomplish with their lives? I am excited to watch them blossom. My sister always reminded me that our job was to give them both roots AND wings, and it looks like we did that. Molly's high school graduation with friends. 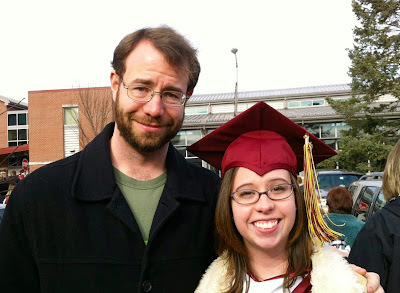 At her commencement last week, one of the speakers talked about the word "commence". It struck me how it all depends on how one looks at it. 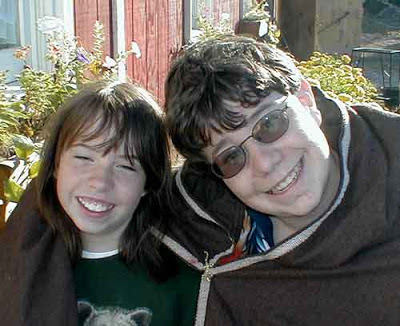 For so many years my one firm goal was to see that she got through school and had as many opportunities as I could possibly provide, so it felt like an ending. But it isn't. It is the beginning. Finally college. Through thick and thin. Fly, my sweet little bird - but don't forget your roots. The Jan/Feb '13 issue of The Essential Herbal is in the mail, and pdf subscribers will receive the file on the 20th of this month. We are thrilled with this issue as we begin yet another year. 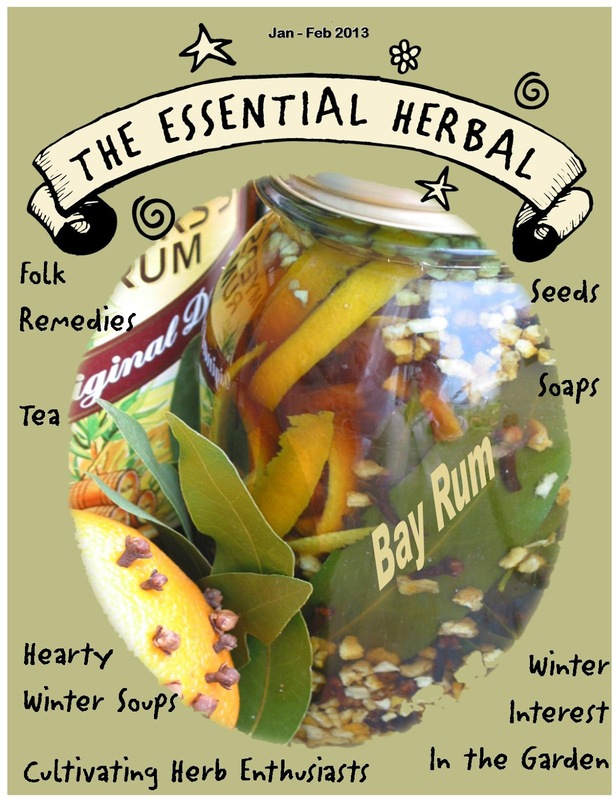 Our cover is from Susan Hess of Farm at Coventry, who took the picture while making Bay Rum aftershave with the students of her Homestead Herbalism class series. She sent along the recipe, too! Each year, I can't help but look back over the distance we've covered. It's been a while since we've included a crossword puzzle, and we now have "The Vault", an epic collection of herbal newsletters spanning nearly 40 years from Bertha Reppert (gifted by her daughter Susanna of The Rosemary House) which, for this issue brings us a wonderful article from Jim Long. We've got scores of recipes and herbal concoctions inside to get any herbie itching to get to work. It's another good issue. So here we go, folks. Let's see how wonderful we can make another year! When do we decide to claim our knowledge? It can only be called an event when Rosemary Gladstar puts out a new book, and Carey even obtained permission to include a couple of the recipes from the book! More than the description of a color, this flower has lots to offer. Jackie shares some of the herb lore that we all love so well. She finds some unusual stories for some of our favorites. At this time of year, just before we start to plant, seeds as food make tasty additions. Natural grout scrub made with household staples and essential oils! Years ago in Missouri, Grace Hudson traveled with her husband and family to logging camps, taking along her folk remedies and knowledge. How many times have we talked about finding other herbies nearby to learn with? Jacquie tells us all about the beginnings of the Florence (OR) Herb Enthusiasts, and how they’ve grown and grown. For those who want to make fragrant soaps that include properties from essential oils and avoid using lye, melt & pour bases are the answer. How and why of adding herbs to soaps that can be used almost immediately. Sandy’s resolution for the new year is to share her collection of herbal remedies far and wide. With this article, she makes a pretty good start with five simple ideas to get you motivated. Six delicious vegetarian soups that combine flavor with healing and comfort. What could be better for these short, dark days? A plant named Oplopanax horridus (“Devil’s Club”) doesn’t sound like it would be healing, and yet it has many beneficial properties. Reading in bed is fine, but when it turns to sleep deprivation, a good tea just might to the trick. Curl up with the mag, a pencil (or pen if you’re bold) and have some herbie puzzle fun. A family tradition that we (almost) all love. Instead of looking out over the stark and often monochromatic landscape, try some plantings that will shine all year long. Start a little something going on inside now to hold you til spring. A bushel and a peck of treats for your winter-weary skin and hair. Some Valentine’s Day herbal creations to make, along with some herb lore! The topic of bay leaf garlands came up yesterday, and since it's been a while since making one, it seemed like it would be a fun thing to do. The dining room light fixture holds my collection of pinecones and leaves, but needed something a little festive for the holidays. First step is to gather the ingredients. It would be wonderful to use fresh bay leaves right off the tree, but here in the Northeast, that isn't going to happen. Dried apples, oranges, and lemons are good additions. Herbs and spices like cinnamon sticks, cardamom pods, rose hips, star anise , allspice, and dried ginger are lovely. I happened to gather up the blossom ends (I think) from the persimmon tree this summer, and they are lovely, and some goji berries for color are nice too. Cinnamon, cardamom and rosehips need to be soaked before using. Allspice too (although it isn't used here. Soak star anise only as long as necessary or it will fall apart. I was going to try maqui berries, but they don't work. Then, some strong hemp twine, a tapestry needle, and maybe some ribbon, and we're all set. For the end, I tied a good strong loop, and then tied a ribbon/bow there. The trick to making these garlands quickly is to just jog up a handful of the leaves and spear them together. Some will not be pierced and they will fall away as you work. That's okay. A plain bay leaf garland is gorgeous, but I can't ever leave well enough alone. I teamed many of the ingredients together, although one would be hard-pressed to find anything resembling a regular pattern. I added a wee lavender wand from last summer. Because this particular garland was meant for a fixture with 5 candles, there are 5 segments with loops tied in almost even lengths along the way. Finished and laid out on the table, ready to hang. Perfect for me - a little odd. In the end, I think that a solid garland of bay with some ribbons would suit this use best - but I like what came of it. Below you'll find links to many herbal crafting items, This is a good representation of the kinds of things you'll find in The Essential Herbal magazine and our books. We're about to start work on the 2nd 5 year volume as soon as the dust settles in January. Gift subscriptions are always a great idea, by the way. Perfect for last minute, too! Note the links to suppliers (over on the right sidebar) who help support the magazine through advertising. Check them out!